My yasai katsu curry with some wok fried greens and Milly tucking in! As I mentioned in my post about the Princesshay late night shopping event, which I attended a couple of weeks ago, one of my highlights of the night was being treated to a scrummy meal at Wagamama! 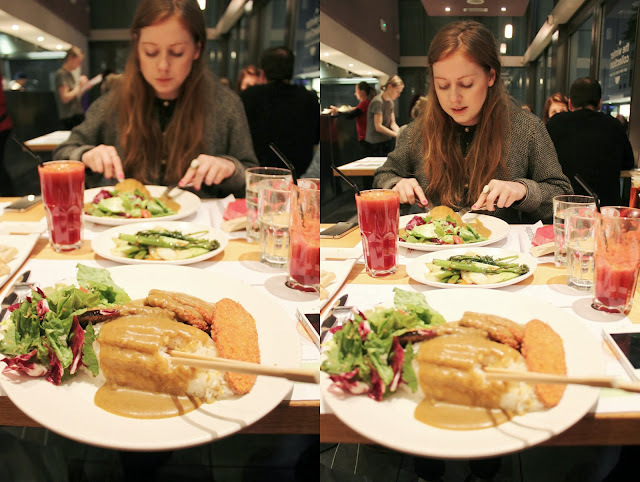 It was the perfect opportunity to meet the other bloggers and to sample Wagamama's new winter menu. 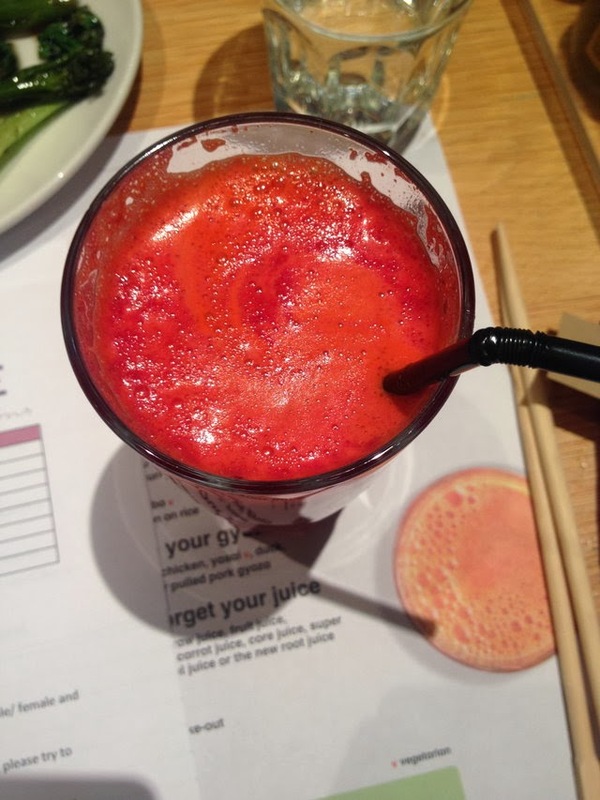 First up we all tried the beetroot, carrot and orange 'root juice' which is the new addition to their juice collection and surprisingly tasty. I like beetroot in things like soup but with the orange in this smoothie it was surprisingly refreshing and zesty... and really pretty colours! Beetroot is also really healthy and an amazing source of antioxidants. I'm a vegetarian and I usually go for the noodle dish 'Yasai Yaki Soba' but I wanted to try something different so I went for a more winter friendly warming curry dish; 'Yasai Katsu Curry'. It features breadcrumbed slices of aubergine, butternut squash and sweet potato. I also had one of the new side dishes 'wok fried greens' which was broccoli and bok choi stir fried in soy sauce and garlic. I tried very hard to eat everything with chopsticks but had to give up quite quickly, it was still as scrummy with a fork though! Have you been out anywhere to eat lately? the food looks very yum! I doooo think I prefer the noodle dish I usually have though to the curry... theres also a mushroom soupy thing that I wasn't brave enough to try! I went to the launch of the winter menu in Glasgow, it's delicious! You should have tried their new desert, to die for! mhh yummy :) I love wagamama!